From Goodreads: Humans and androids crowd the raucous streets of New Beijing. A deadly plague ravages the population. From space, a ruthless lunar people watch, waiting to make their move. No one knows that Earth’s fate hinges on one girl. I absolutely loved this book, the story was very enjoyable. If I didn't have other responsibilities, I would of read this book in one-sitting. It is a bit predictable, but it didn't stop me from rating it 5 stars on Goodreads or from enjoying the book. 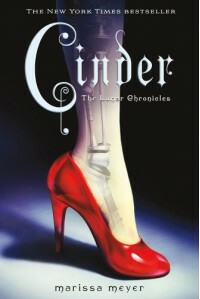 Cinder is based off of Cinderella, set in the future. Cinder is a Cyborg who was "adopted" into a family when she was eleven years old. There is an e-book novella that gives a bit of a background story that I read before reading Cinder, and I highly recommend reading that first. She has no memory of her life or what happened to her before then. Her stepfather died relatively close (from Letumosis, a very deadly disease) to after she came to live with his family, and her stepmother, Adri, doesn't want her there. Cinder has two step-sisters, one not so nice, while the other, Peony, is Cinder's only human friend. She is also friends with the household android, Iko, that has developed somewhat of a human personality. I disliked Adri and the "evil" stepsister Pearl, a lot, and hated the Lunar Queen even more. Cinder and Prince Kai are very likable characters, along with Peony, and the funny household android Iko with the human-like personality. I highly recommend reading this book. I'm mad that I didn't read this sooner! Now, I'm on to reading the next book, Scarlet.